Revanesse Ultra is a highly-viscous injectable filler that contains cross-linked hyaluronic acid. Containing a high concentration of this, this cosmetic filler dramatically improves the appearance of deep lines and wrinkles. The formulation is supplied in sterile, prefilled syringes, and it comes with four needles and a package insert. Having been approved by the FDA, the filler has been proven to be clinically effective and safe. Revanesse Ultra is a product of Prollenium Medical Technologies, Inc., a Canada-based healthcare company. What is Revanesse Ultra is formulated to do? 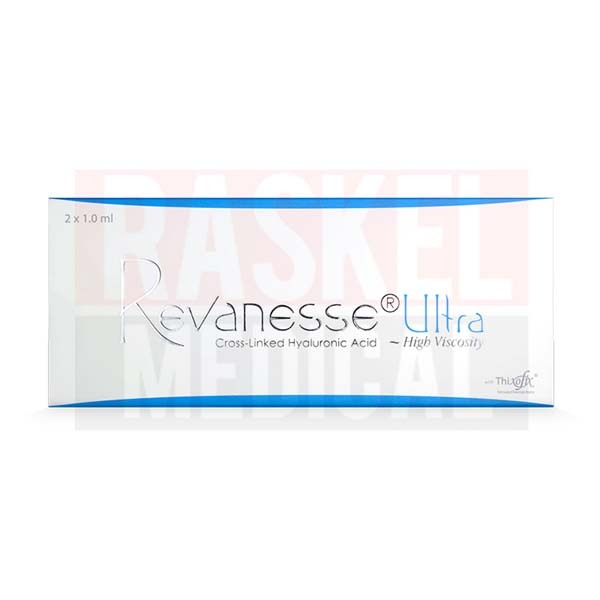 Revanesse Ultra is mainly indicated for the treatment for mid-to-deep folds, wrinkles, and lines. It is also used to enhance facial volume. Infused with potent hyaluronic acid, the injectable instantly smooths and fills wrinkles and lines for younger-looking skin. Compared to other Revanesse fillers, Revanesse Ultra has a thicker consistency and higher viscosity. Due to its unique properties, the filler has a longer duration of action than conventional products. The hyaluronic-rich preparation is ideal for skin with deep, prominent wrinkles and lines. It is also suitable for skin with marionette lines and nasolabial folds. 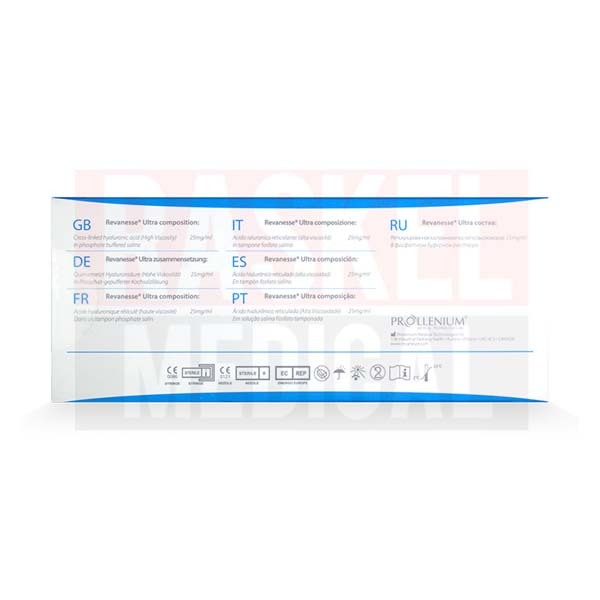 Revanesse Ultra is made in Canada by Prollenium Medical Technologies, Inc. Founded in 2002, the company develops and distributes a wide range of aesthetic products, including cosmetic fillers and surgical equipment. In addition, the company also manufactures implants, hyaluronic acid, botulinum toxin, and skin care products. Prollenium Medical Technologies, Inc owns a manufacturing site in Toronto, Ontario, and is headquartered in Aurora, which is also located in Ontario. Revanesse Ultra is manufactured in Toronto by Prollenium Medical Technologies, Inc.
As with other fillers, Revanesse Ultra can potentially cause undesirable effects such as redness/erythema, pain, tenderness, swelling, discoloration, and itching. These reactions are usually mild and will eventually subside on their own. Less commonly, the filler may result in glabellar necrosis, granulomas, hypersensitivity, and the formation of abscesses. This may not be a complete list of side effects. Refer to the package insert for a full list of side effects, warnings, and contraindications. If any adverse effects are prolonged or worsen, your patient should contact you or another medical professional. The injectable is perfect for sunken skin in the cheeks. As mentioned above, it is also ideal for skin with deep wrinkles; lines; and folds, such as nasolabial folds. Having undergone thorough safety assessments, Revanesse Ultra is well-tolerated by most patients. The formulation is supplied in sterile, prefilled syringes. This injectable cosmetic filler has been approved by the FDA (Food and Drug Administration). Administer Revanesse Ultra via mid-to-deep dermal injections to correct moderate to severe wrinkles. The injection should be carried out using a 27-gauge needle. The treatment should only be performed by certified and licensed personnel. Patients should not attempt to inject themselves, as self-injection may cause a number of health complications. Refer to the package for more detailed instructions on the injection process. After the injection, patients may experience pain and swelling at the injection site. An ice pack can be used for symptomatic relief. Patients should avoid taking blood thinners three days after the procedure. Additionally, it is important for said patients to limit sun exposure post-treatment. Revanesse Ultra contains 25mg/ml of hyaluronic acid in phosphate buffered saline. Hyaluronic acid is a water-absorbing polysaccharide that can be found naturally in the body. Sourced from streptococci bacteria, the filler is unlikely to cause any immunogenic reactions in patients. When inside the skin, the hyaluronic acid attracts and retains water, which in turn provides volume for the skin. With the addition of volume, wrinkles and folds are filled in and smoothened out, causing the skin to look considerably younger. Once injected, however, the hyaluronic acid is slowly decomposed by enzymes and absorbed into the skin, so Revanesee Ultra’s effects are temporary. Phosphate buffered saline (or PBS) is made up of a number of compounds, including sodium phosphate, potassium phosphate, sodium chloride, potassium chloride, and sodium phosphate. It is a buffer that maintains the pH of the formulation. 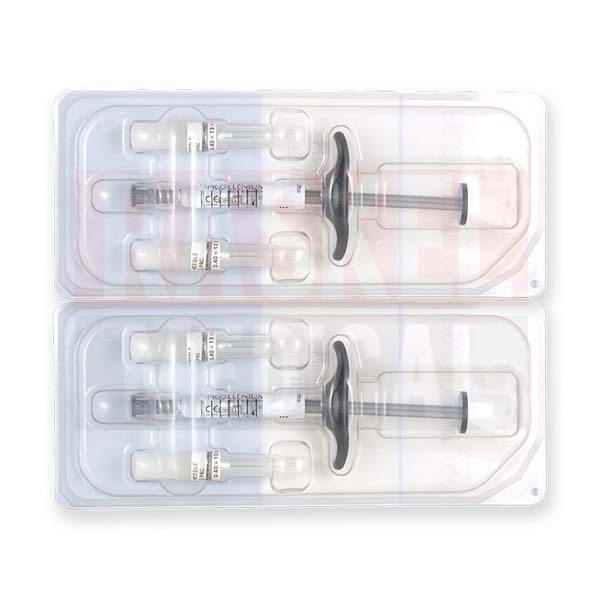 Two prefilled syringes that each contain 1ml of this product. Four 0.40 x 13mm needles. A package insert that contains important information such as indications, contraindications, storage methods, use instructions, side effects, and a list of ingredients. Formulated using the innovative Thixofix technology, Revanesse Ultra is able to deliver durable results. It can last for 9–12 months in most patients. Keep Revanesse Ultra in an environment that has a temperature range of 2°C to 25°C. Do not freeze this product and avoid exposing it to extreme heat. Store Revanesse Ultra in accordance with the above instructions. Otherwise, the active ingredients may degrade prematurely, rendering the filler unusable before its expiry date. Do not use expired injectables. The active ingredients can deteriorate after the expiration date. As a result, the filler may not be as effective. At RaskelMedical.com, we know that no practitioner wants to stock out on an in-demand treatment. That's why we make it easy to order Revanesse Ultra in bulk, ensuring a steady supply for your facility. We offer a 100% satisfaction guarantee and the assurance that all of our products come from their original manufacturers. Looking for authentic Revanesse Ultra delivered fast? Then you've found it at RaskelMedical.com. 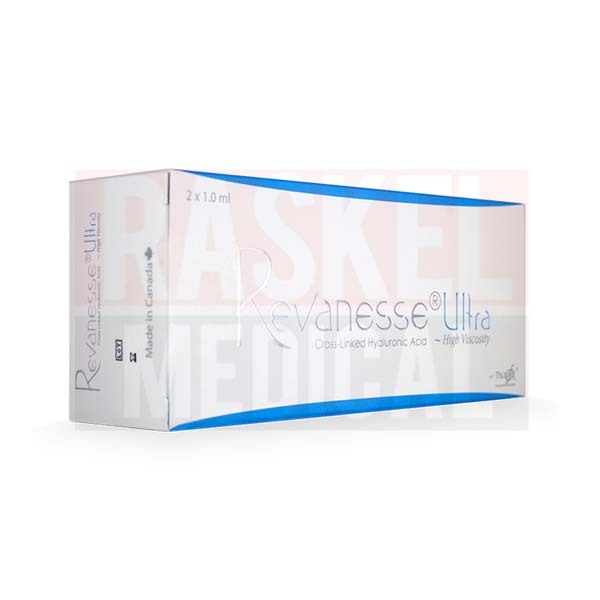 You're a medical professional who wants the highest level of service and quality when purchasing Revanesse Ultra. That's why RaskelMedical.com exists. We guarantee that our authentic Revanesse Ultra products come from their original manufacturer, Prollenium. At RaskelMedical.com, we want to become the trusted source for all your clinic needs. Whether you're a nurse or doctor, we provide licensed professionals with a safe, secure way to buy Revanesse Ultra online. Rest assured that not only will you get the lowest prices, you will also receive high-quality products direct from the manufacturer. Order with confidence! Our dedicated service personnel are ready and waiting to process your purchase.